This piece is shown at TURF PROJECTS, London until 15th July. Cradle Game title is borrowed from a video game . It was included in a collection of works as an installation at AIRSPACE gallery in 2011. They were all situated under the umbrella title "Disappearance of the world resemblance of the object" exploring time, space and value. 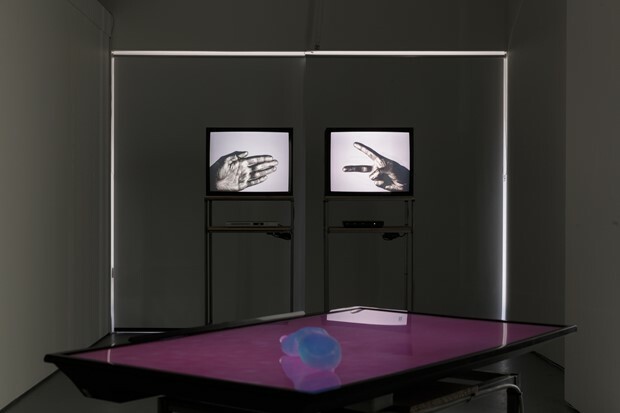 In this piece I have paired it down to one image sequence (video) across two screens utilising the failure within technology to make it operate a real possibility of chance, in a humane way. Using two DVD players without any sync mechanism the image played via two TV monitors will display at first the same image repeated across the two screens. As time moves forward, the DVD players starts to drift due to it's incapability to uphold the same speed over time, and so the mechanism within them will start playing the game paper, scissor, stone, within it's own technological structure, by chance. Although switched on simultaneously, within space and time they will start to drift, and the image appearing will play the game for real.